Childish Gambino’s new music video for “This is America” begins as though it is an early entry for 2018 Song of the Summer. Unseen people sing at what sounds like some kind of beach party, while a guitar sits alone onscreen, waiting to join the fun. In just four minutes, “This is America” shuttles through an astonishing number of referents to both current affairs and black culture. Meanwhile onscreen we pan to the still form of Gambino (a.k.a. actor and writer Donald Glover). Seemingly awoken by the bass beat, he slowly turns toward us and begins dancing. How to talk about this extraordinary piece of work? In just four minutes “This is America” shuttles through an astonishing number of referents to both current affairs and black culture, including gun violence, police shootings, school shootings, OK Go’s Rube Goldberg-style music videos, rap video thug and bling posing, urban riots, the 2015 Charleston, S.C., church shooting, gospel choirs, the gospel of prosperity, Jim Crow imagery, “Get Out,” lynchings, memes, Michael Jackson, viral dance videos and Glover’s former role as nerdy community college kid Troy Barnes on the TV show “Community.” All the while Glover mostly dances his way through an abandoned warehouse with happy school children as chaos ensues in the background, his eyes rarely leaving us. Critics have talked about the piece in a similarly dizzying variety of ways. Rolling Stone’s Tre Johnson calls it “an upsettingly vivid illustration of the Faustian bargain that black America makes on a regular basis, trading our bodies for our expression and freedom.” And indeed at times every physical gesture and spoken line by Glover seems to offer another pose black performers are forced to take in order to, as the gospel choir sings, “Get your money, black man.” It is clearly no coincidence that Glover released the video at precisely the moment he was performing the song for the first time on “Saturday Night Live,” where he was also doing exactly the kinds of sketches he was indicting. The video is the apotheosis of viral culture and its incessant reappropriation of images, events and ideas for ironic purposes. In a way, the video is the apotheosis of viral culture and its incessant reappropriation of images, events and ideas for ironic purposes. Yet here the irony is leveled against that culture itself, the way that it flattens everything to a punchline. The so-called “meta” and “self-aware” prove to be just further mechanisms of self-delusion. Empathy and self-reflection have no place in the land of the GIF. The entertainment they offer is just another kind of slumber. Our awakening seems constantly to require violence of its own. In the revelation of that violence, Girard posits, lies the possibility of our freedom from it. Yet paradoxically our awakening seems constantly to require violence of its own. Then suddenly a roadside accident brings the woman face to face with The Misfit, an almost mythical figure who has been haunting the countryside, killing people. As members of her family are led two by two away to the nearby woods, the woman insists he is a good man. For Glover and O’Connor both, it is only through an experience of radical interruption is conversion to a life of discipleship even remotely possible. No matter the example of Christ or the witness of journalists, activists and artists, the impulse to drown out the cries of society’s victims remains as seductive as a great meme. For Glover and O’Connor both, it is only through an experience of radical interruption—where the floor drops out on us and the rules by which we believe the world works are revealed to be convenient fictions—is conversion to a life of discipleship, the path of goodness, even remotely possible. What’s behind hip-hop’s religious revival? 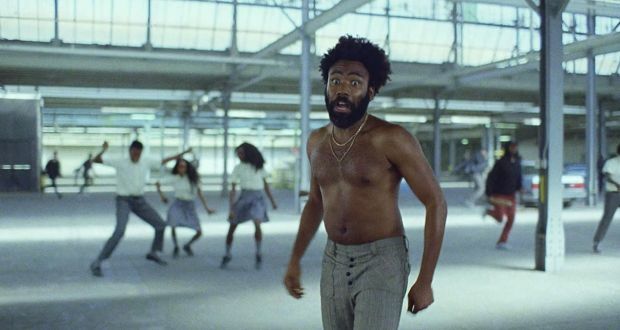 Since “This is America” dropped, people have pulled endless GIFs from it, many of Glover dancing happily, as though this really is a dance video and also some of the horrifying moments like the final shot of him running for his life. Meanwhile, others are remixing the video to upbeat summer songs. Don’t bother us with truth or suffering. We just want to party. O’Connor, too, was well aware of the strength of our resistance to conversion even after a moment of revelation. “Some fun!” says one of The Misfit’s henchman after the woman’s brutal murder. I think "A Good Man is Hard to Find" unmasks a common center for evil in the grandmother and the "Misfit". It also references a common source of redemption, i.e., the Lord. I do not get a sense of revulsion from Flannery's story; on the contrary I get a sense of wakefulness and a hint of hope. On the other hand, with "This is America", despite its artistic charm, I do get a sense of revulsion. Revulsion to what? Violence and bigotry, surely, but also revulsion to the perpetrators of the violence, i.e, white America. The video seems without nuance. So unlike Flannery. How is white America responsible for a black man killing another black man? Stupid identity politics. Better yet, how is the bigotry against "white America" based on any reality at all? Why aren't people just people, neither black nor white, but rather children of God? Fair enough. My thought put the video in the context of the killings by Dylann Roof of 9 African Americans. Thanks for the correction. An obviously morally degenerate video but sanctioned because the people are talented and attractive to some and the music resonates. . The narrative which is a false one also will be used to generate sympathy. If an attractive person commits a crime there will be sympathy for the person. The same crime by an unattractive person will create disdain for the person. I guess this is like the Yanny Laurel effect so the rage now. I cannot think this adds to our culture in any positive way, whereas FOC did bring so much, telling her horrifying stories against a morally conscious deeply Christian background. In this video, all I see is an ISIS-like assassination of a hooded black man and mowing down of a black choir - all black on black violence, all trivialized by dancing to inane vocals. I wonder if this video was made by the NRA, would it be as popular? The stupid part is that the suffering of identity politics groups of any type is largely self-inflicted these days. Nobody cares over a blind text terminal interface what you look like, what skin color you have, who you are sleeping with, or how you live. Telecommuting is the great equalizer; in the more educated professions you can end up being paid by people you never meet in person. And the best part of all? The same is true of people who TEACH those professions- online education is now cheaper than ever before with many courses even being offered for free. There is no longer a reason to leave your house and put your body in danger to make money. Brilliant commentary on Childish Gambino. When I first saw This is America, I needed to take a step back as I wasn't sure what images were reeling through my mind. I watched it a number of times and each time it gained more power. I felt that it painted a true portrait of American society today. Donald Glover is a talented artist. Some images are difficult to assimilate; but, they are vivid and real. The latest "pile of stones" are the many monuments and tombs erected in the 1920s by revisionist historians to honor the leaders of the Confederacy. Donald Glover's Childish Gambino hits us over the head with the same message that Mitch Landrieu tries to communicate in his book, In the Shadow of Statues: A White Southerner Confronts History. This article also appeared in print, under the headline "A Flannery O'Connor story for the world today," in the June 25, 2018 issue.